It would nearly seem superfluous and reductive to say that Ravello is the jewel of the Amalfi Coast! Sometimes just the Amalfi Coast identifies itself with Ravello! Ravello is a town "to listen", for its famous concerts of international attraction, "to admire", for its architectonic beauties and its wonderful scenery, "to taste", for the skill by which the Mediterranean Kitchen is reinterpreted in order to exalt the tastes and the typical products of this corner of paradise. 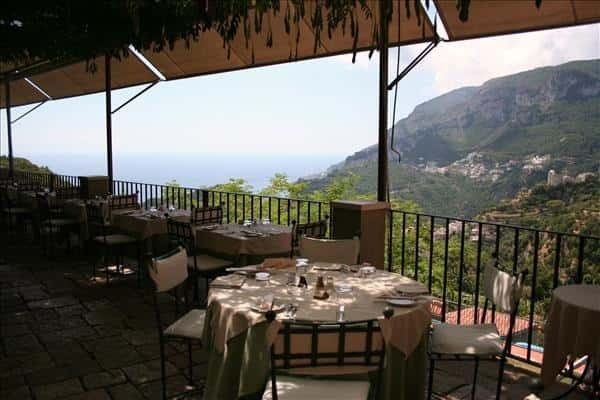 In the quiet area of Ravello, accessible only on foot (but the parking car is not too far), in the shadow of imposing lime trees and scented wisterias, Villa Maria Restaurant offers its guests the pleasure of a charming view of the Amalfi coast, the peace and serenity that are typical of these locations, an excellent staff, the security of fresh, biological and high-quality ingredients, a good choose of wines. At Villa Maria Restaurant, owned by the Palumbo family, well-known hotelkeepers from Ravello, who consider hospitality as an art more than a profession (www.vipaalberghi.it), in a fresh Sunday of July, with a pleasant background jazz music, we chose two different hors d'oeuvres, "Parmigiana di pesce" (fish parmigiana) with an unexpected delicate taste, and "Seppie, sedano e noci" (cuttlefish, celery and nuts), three simple ingredients...the exultance of the culinary art. The first courses were "Paccheri alla pescatrice" (Paccheri pasta with devilfish) and "Ravioli di pesce" (Ravioli stuffed with fish): both of them were excellent, al dente coocked, well seasoned and...with an extraordinary taste! Angelo, the headwaiter, advised us a "Filetto di pesce in guazetto con patate" (Fillet of fish with potatoes", a not too much seasoned second course in order to exalt the freshness of the ingredients. The local kitchen brigade, directed by the chefs Giuseppe D'Auria and Giovanni Cozzolino, is also superior in the preparation of the desserts: the vanilla and chocolate soufflé is simply divine! Villa Maria restaurant has a well-stocked wine cellar and we sipped "Pallagrello d'Alois", a white, young and fresh wine, soft on the palate and medium body. Everything was perfect and flawless! 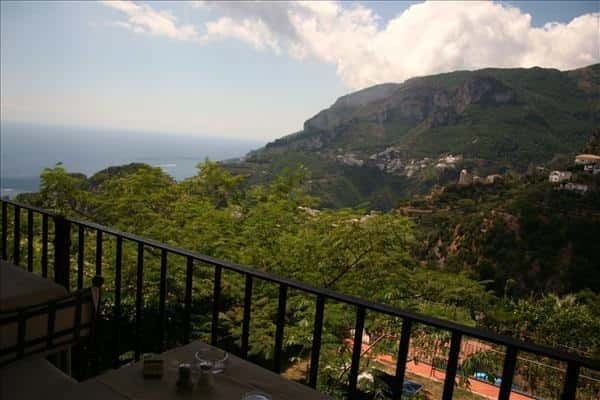 Only one useful tip: once you enter the Villa, turn off your mobile phone, leave the world behind you...you are entering the heart of Ravello where calm and serenity of the soul show themselves in all their essence! You have to savour the charm of this location in silence; only in this mood you will have the certainty that the paradise on earth exists!